Spain opened its first Alta Velocidad Española, or AVE (meaning “bird” in Spanish), high-speed train route in 1992 — the same line President Obama referenced. 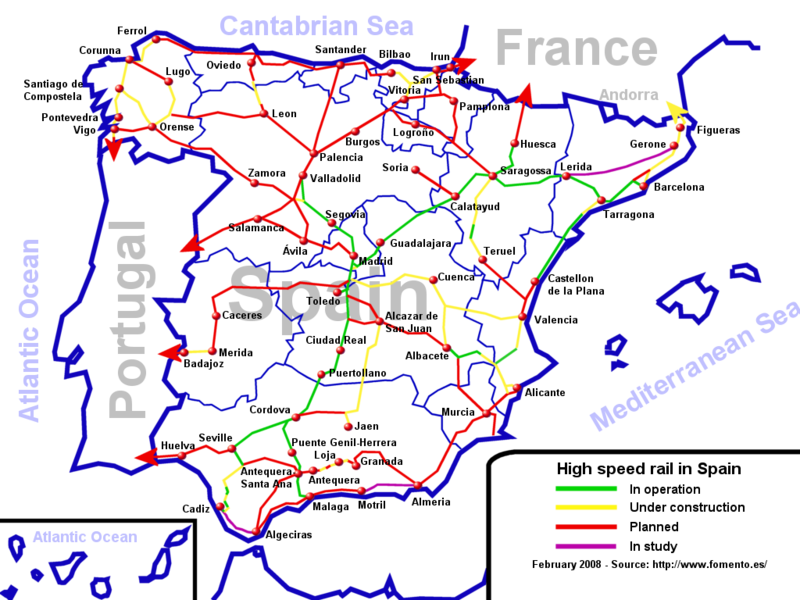 The network has spread out since, with trains traveling at speeds up to 218 mph over 1,242 miles of rail from Malaga (the south coast) to Barcelona (the northeast coast) and points in between. Two years ago, the Madrid to Barcelona line opened. As a result, what was one of Europe’s busiest air shuttle routes lost around half its passengers to high-speed rail. Following this success, Spain plans to build 6,200 miles more of high-speed track by 2020 — positioning nearly everyone in Spain within 30 miles of a high-speed rail station. In that same time, California, with a population about four-fifths the size of Spain’s, will have just opened its first high-speed route — 432 miles of track built over nearly a decade. Reaching speeds of over 200 mph, it will also be America’s only true high-speed rail in operation, with the Acela Express in the nation’s northeast traveling at speeds of 50 to 100 mph less. Already, Spain has spent $130 billion on its current high-speed train system. In the next decade, it will spend over $100 billion more. At the same time, however, this substantial investment in high-speed rail infrastructure has come at the expense of the country’s freight-rail network. With little government investment, businesses have moved their goods to the road — resulting in an economy highly sensitive to changes in the price of crude oil. 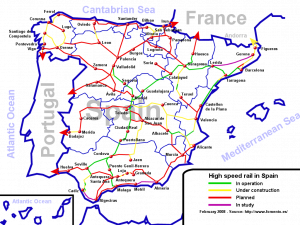 Still, Spain has been able to leverage funds for its infrastructure — especially high-speed rail — to an amount the United States cannot currently match. Norman Anderson, President and CEO of CG/LA Infrastructure (a Washington, D.C. based consulting group) — in an extended interview from Blueprint America: Beyond the Motor City — explains how Spain has been able to finance its infrastructure build out, and what America has to learn. As President and CEO, Anderson focuses on infrastructure project creation, aimed at increasing the level of infrastructure investment, and the performance of existing infrastructure stocks, in developed and developing countries alike. He has overseen the development and execution of CG/LA’s proprietary analytic models, including: The Global and Latin American Annual Infrastructure Capacity Rankings; The “Eight Criteria for Assessing a Country’s Infrastructure Capacity,” and CG/LA’s 5 year and 20 year infrastructure demand models. Anderson recently completed a White Paper for the World Economic Forum on infrastructure in Latin America, and was subsequently asked to edit the companion series of papers on the U.S., China, India, Africa and Asia. In July 2008 he published “Outlook for Infrastructure” in The Future of North America 2025; Outlook & Recommendations,” a CSIS publication financed by the Canadian, Mexican and US Executive branches.